A little over a month ago, I acquired an Xbox 360. Barring the Red Ring of Death (so far, so good), it's really a pretty good system. The games are good, and the online features are nice, but this past weekend, I discovered something great about the 360. It introduced my TV to my PC, and they've been good friends ever since. I've got a wireless network set up at my house, and the 360 is able to use that network to access the photo, music, and video files that I have saved on my PC. In other words, I can watch all of the cool videos on my hard drive from the most comfortable seat in the whole house - my sofa. We've all seen it. You're in a department store, walking by the electronics area, and it's right there in the main aisle. The Bargain Bin. Full of CD's/DVD's that just won't sell anywhere else, the bargain bin can be a treasure trove for the patient. Admittedly, most of what one finds in these bargain bins belongs there. Most of it. Every now and then, however, patient searching will reveal a true gem. As I recall, it only cost me about $5, and it was well worth it. 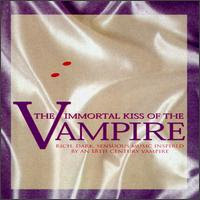 This CD starts out wit a brief narrative from the titular vampire, which introduces the darkly romantic theme of this CD. The music is keyboard driven, mostly piano pieces, and it is excellent. There is not a song on this CD that I don't like. A couple of them are reminiscent of Castlevania - Symphony of the Night. This CD has been in my regular rotation since I bought it. over 10 years for about $5.00 - not a bad deal.